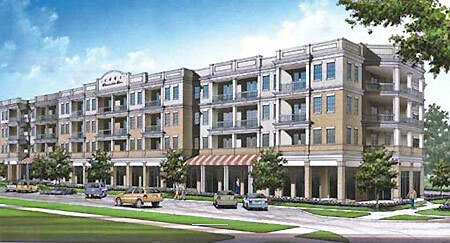 1661 Riverside condos & townhomes in Jacksonville, Florida. 1661 Riverside brings modern living and sophisticated urban architecture to the heart of one of Jacksonville's most unique, livable and walkable historic neighborhoods. Perfectly situated overlooking the beautiful century oaks and riverfront promenades of Memorial Park, 1661 Riverside offers 1, 2 and 3 bedroom residences, including 69 contemporary lofts and 21 more traditionally-styled townhomes. Loft architecture is urban contemporary with features such as exposed structure ceilings and stained concrete floors. Each townhome will include its own private courtyard, and most lofts will feature balconies overlooking one of Jacksonville's most unique communities. Designed as an urban village with ground-floor retail shops for true live-work-play potential, 1661 Riverside's striking design, true in-town convenience, and planned concierge services are just the beginning of an exciting new cosmopolitan lifestyle near the heart of Jacksonvilles downtown urban center. Community amenities include concierge service, private garage parking, individual storage units and a private owners' rooftop lounge, offering a panoramic view of Riverside-Avondale and the scenic St. Johns River. If you would like to receive real-time MLS report, current listing and most recent homes sold in this community, click here. Floor Plan Room Under A/C Sq.Ft. Balcony Sq.Ft. Total Sq.Ft.